Lois Arline Benson, 89, of Lakota, ND, went to be with the Lord and her loved ones August 11, 2018, just 9 days shy of her 90th birthday. Lois was born August 20, 1928 to Edward and Flora (Benz) Guthmueller in Merricourt, ND. She was one of 7 children and was raised in Merricourt and later Kulm, ND, where she would graduate as Salutatorian. It was in Lakota, ND that she would meet and marry Robert Benson. They were united in marriage November, 27, 1946 and would welcome 6 children to their family. Lois was a devoted mother and housewife. She worked alongside Bob in his construction business and their carpet store, building and finishing many homes and businesses in the area. Lois also worked at the Gronna Good Samaritan Center in Lakota in the dining center and activities. Shortly before Bob’s death in 1984, they converted the carpet store into a daycare, where Lois became “Grandma” to many more kids until she retired. Lois was well known for her orange house and her green thumb. She was an avid quilter, sewer, baker, gardener, reader, and artist. She loved country music and the Minnesota Twins. She was an active 4-H leader, member of the Lakota American Legion Auxiliary, and a Sunday School teacher at the Lakota Lutheran Church. Lois loved to travel and collected patches from many of her adventures. She traveled often to partake in her grandchildren’s activities and they were the sparkle in her eye, especially when they gave her great-grandchildren. 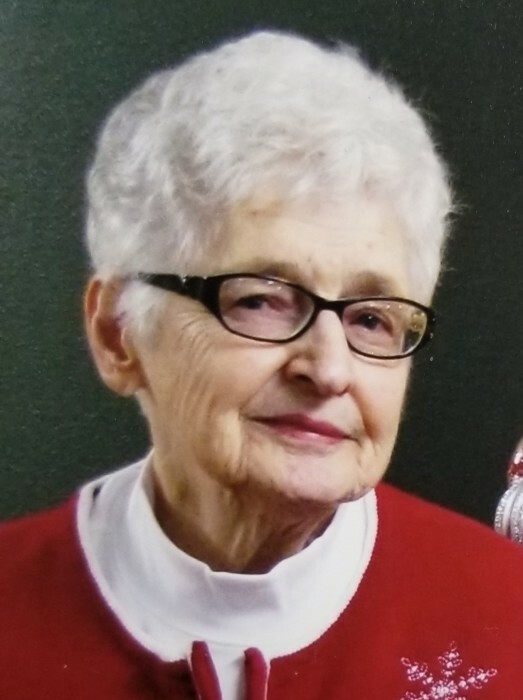 She will be missed by many, including her children, Robert (Eleanor) Benson of Dallas, TX; Gregory (Mary) Benson of Longmont, CO; Ronald (Lorna) Benson of Mott, ND; Thomas (Emilie) Benson of Lakota, ND; and LaVae Benson of Bismarck, ND; 13 grandchildren; 25 great-grandchildren; numerous daycare kids and families; brothers, Edward (Shirley) Guthmueller of Branson, MO; Louis (LuAnn) Guthmueller of Green Valley, AZ; and Eugene (Dee) Guthmueller of Shoreview, MN. She was greeted in Heaven by her husband, Robert Benson; son, Steven Benson; sisters, Phyllis Ode, Mavis Seitz, and Shirley Peterson; and her parents. Visitation will be held at the Aaker Funeral Home of Lakota, ND, on Friday, August 24th from 5-7 p.m. with a Prayer Service at 7 p.m. The Memorial Service will be held at the Lakota Lutheran Church on Saturday, August 25th at 11:00 a.m. with graveside service and lunch to follow. Honorary Pallbearers will be Lois’ 6 grandsons, Eric Benson, Chris Benson, Brent Benson, Tyler Fandrich, Mike Benson and Tim Walford. The family would like to thank the Lakota Good Samaritan Center and Dr. Downs for the care they gave to Lois.